First impressions can be deceptive and even the most plausible, honest looking people can prove to be difficult tenants. This is why property management companies or letting agents always take screening of potential tenants very seriously. A good company will carry out credit checks and evaluate references to make sure the chances of taking on responsible, reliable good quality tenants is as high as possible. After all, a tenant who pays their rent on time and takes care of your property is not only good for you, but is also a lot less hassle for a property management company. There are a number of safety regulations that need to be met before a property can be let e.g. electrical inspection (EICR), energy performance certificate (EPC), landlord gas safety inspection, Legionella risk assessment and the correct number of carbon monoxide and smoke/heat detectors. A property management company will advice on all current safety regulations and can arrange the necessary checks to be carried out to ensure that your property is fully compliant. They can also coordinate any work required to resolve any issues that are found. It is the job of a property management company to help you achieve the best financial return on your property. To do this they need to ensure that your property has quality tenants in place, paying rent, as quickly as possible. This means they will work hard to help you get your property ready for the rental market. They will ensure that it meets all legal requirements and is presented to its best advantage. They will then advertise it on a number of popular letting sites so that it is seen by as many potential tenants as possible. At the end of a tenancy a good property management company will also have a set of processes in place to check tenants out of a property quickly and efficiently, ensuring that it is left in tip top condition, or if required, brought back up to standard quickly, ready for the next tenants to move in. Letting agents understand and keep a close eye on market conditions and property demands in your local area. They will quickly be able to establish the current rental value of your property. They can also offer advice on easy ways to maximise your rental income e.g. freshening up the rooms with a coat of paint or replacing worn out carpets or flooring. They can even arrange tradesmen to carry out this work for you. When there is a problem in your property e.g. the heating stops working or the washing machine breaks down, action is needed quickly. This can be difficult if you are working, on holiday or just plain busy and it can also be difficult finding the right person to deal with the problem. A property management company will have access to a network of fully qualified tradesmen they can get in touch with to fix the problem. They will also take on the task of liaising with the tenants to agree a suitable time when the property can be accessed in order to carry out the repairs, saving you a whole lot of time and hassle. They will also carry out periodic inspections to check that the general standard of your property is being maintained throughout the length of the tenancy. 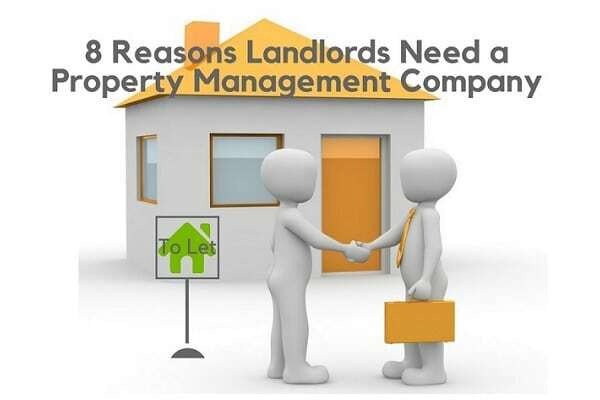 Having a property manager as the point of contact for tenants can take away a lot of the stress of being a landlord. All tenant interactions can be dealt with professionally without you having to deal with uncomfortable or confrontational conversations about late rent payments, evictions or unreasonable damage to your property. Ensuring that rent is collected every month is a key concern for many property owners. This is where a property management company can be useful as a buffer between you and a late paying tenant. They will be very familiar with this type of situation and can usually employ tactics to resolve the situation in a professional manner before it escalates further or becomes personal. On the very rare occasion that no resolution can be found they will start legal proceedings on your behalf, to get the tenant evicted. A tenancy agreement is a contract between you and your tenants and is required by law. It protects your property, sets out your obligations and that of your tenants and prevents potential disputes happening in the future. A property management company can help you draw up a tenancy agreement for your property. It will contain standard items e.g. the start date of the tenancy, when the rent is due, the notice period etc. but it can also contain items pertinent to your particular property e.g. whether pets are permitted. New tenants will not be allowed the keys to your property until they have signed this document. Choosing to go down the route of a property management company is a big decision and it is not for everyone. But if you do decide that this is for you, then it is important to remember that not every company will offer the same level of service. Take your time and do your homework because when you do find the right property management company, you may wonder why you ever considered managing your property on your own. Western Lettings is a small independent Property Management Company in the West End of Glasgow. We are ARLA accredited and specialise in letting and managing property throughout the city. Please feel free to contact us for more information about our landlord services.